In the United States as a whole, the white share of the population is declining as Hispanic, Asian and black populations grow. But the shift to a more diverse nation is happening more quickly in some places than in others. Overall, 266 of these 2,440 counties are less than half white. However, many are in urban areas that together account for about one-third (31%) of the nation’s population, despite making up just 11% of U.S. counties with a minimum population of 10,000. These counties are concentrated in California, the South and the East Coast, bypassing much of the country’s middle section. 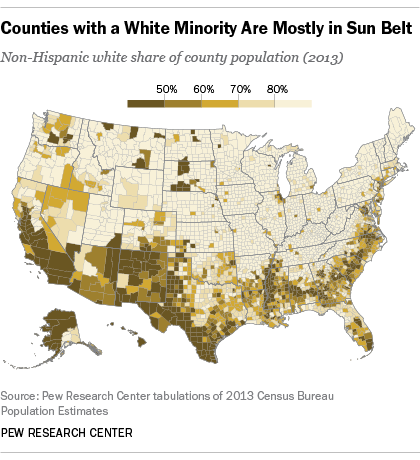 In 19 of the 25 biggest U.S. counties by population, whites make up less than half of the population. Of these, six that were majority white in 2000 are no longer so: San Diego, Orange, Riverside and Sacramento counties (all in California), plus Clark County, Nev., and Broward County, Fla. In addition, whites could soon become the minority in two more counties – Tarrant in Texas (Fort Worth) and Wayne in Michigan (Detroit), both of which are now 50% white. Another way to highlight the nation’s changing demographics is to see how many counties flipped in reverse. From 2000 to 2013, just two counties went from minority white to majority white: Calhoun County in South Carolina and West Feliciana Parish in Louisiana, each with relatively small populations of about 15,000. Among the 78 counties that between 2000 and 2013 went from majority white to places where whites are no longer more than half of the population, 14 were at least 60% white in 2000. Of these counties, those in Georgia stand out for having four of the five biggest percentage-point swings in their white-population share. For example, in Henry County (pop. 211,000 in 2013), 35 miles south of Atlanta, the population’s white share fell from 80.1% in 2000 to 49.8% in 2013. In Gwinnett County (pop. 859,000 in 2013), also near Atlanta, the population dropped from 67.0% white to 41.6% over the same time period. Notes: The non-Hispanic white share of the population in Chatham County, Ga., was 49.97% in 2013. Percentages and percentage point change are rounded to one decimal place and then sorted. Percentage point change between 2000-2013 calculated prior to rounding.